Le printemps est une période spéciale de l'année dans les Berkshires et notre belle maison, avec son aménagement paysager méticuleux, en fait un endroit merveilleux pour accueillir la nouvelle saison. Peu importe la saison, notre maison est plus qu'un lieu de séjour. Nichée sur près de six hectares de bois, comprenant une piscine, une pelouse séparée géante et parfaite pour les jeux de pelouse, des jardins abondants et un porche, la maison a tout ce dont vous avez besoin pour des vacances idylliques dans un lieu idyllique. Située à la limite de New York, à la frontière du Massachusetts, la maison est non seulement proche des pistes de ski, mais elle est idéalement située à proximité de Tanglewood (lieu de concerts), de Jacobs Pillow (spectacles de danse) et des villes historiques des Berkshires (Lee, Lenox, Stockbridge). Les autres activités dans la région incluent la randonnée dans les parcs d'État de New York et du Massachusetts, la navigation de plaisance, les antiquités, une vente aux enchères hebdomadaire et le théâtre. Même si vous choisissez de rester près de chez vous, vous aurez de nombreuses possibilités pour vous divertir en plein air: nager dans la piscine chauffée, jouer au badminton ou au croquet sur la grande pelouse derrière la zone de baignade clôturée, ou encore faire du vélo le long des terres agricoles vallonnées du quartier. La nuit, installez-vous sur le confortable mobilier de pont sous les étoiles sans fin, loin de la pollution lumineuse de la ville. Pour les aventures hivernales, en plus de la station de ski de Jiminy Peak, la région comprend d'autres options pour le ski alpin et le ski de fond. Les amateurs de ski peuvent choisir de louer la maison pour toute la saison de ski - généralement du 1er décembre au 30 mars, ou au mois, moyennant un tarif forfaitaire attractif (plus les frais). Ici, il y a une activité pour chaque saison et une saison parfaite pour toute activité. La maison peut accueillir jusqu'à douze personnes avec quatre chambres à coucher, trois salles de bain et de nombreuses pièces supplémentaires au sous-sol. Bien aménagée, bien meublée et bien équipée, avec une table à manger et des chaises faites à la main, des cheminées à l'intérieur, un foyer extérieur et de nombreux ustensiles de cuisine pour le chef passionné, cette maison a tout ce dont vous avez besoin pour oublier vos soucis et vous Bonnes vacances. Nous fournissons des vélos, des jeux, des jouets de piscine et du confort, et vous fournissez les souvenirs et la joie. Nous espérons que notre escapade dans le pays fera partie des traditions de votre famille. House was fabulous and although we couldn’t take advantage of the pool and grounds due to the winter weather, we’re definitely interested in visiting in the summer! Eugene and Denise were the most gracious hosts who really thought of everything and ensured no detail was missed for our stay. When we noticed a potential snow storm in the forecast, they periodically emailed to check in with us and ensure we were ok. They even arranged to have the driveway plowed first thing in the morning, which was a nice pleasant surprise to wake up to. After each day on the slopes, it was great coming back to such a warm and inviting home to relax and hang out with the family. Our family will cherish those memories forever and that’s the best takeaway from a rental you can ever get. The house is great for families, and has everything you need for a relaxing vacation. The kitchen is well stocked and was easy to cook in throughout our stay. Our families enjoyed the multiple living rooms, and all of the bedrooms were comfortable for sleeping. The house is close to Jiminy Peak - ~10 minutes away. It was perfect for taking our kids back and forth to the mountain. The owners, Eugene and Denise, were great to work with. We had a few questions during our stay, and they responded quickly! If we are back in the area, we will definitely look to rent their house again. Thanks Chris for those kind words. And thanks for treating the house so well. We do hope you come back. A group of us (adults and kids) were very happy that we stayed here. The home is impeccable and gorgeous. The property was amazing with all of the trees and landscape. Too bad we weren’t able to use the pool but It was winter (NYE 2018) and we had the best, most comfortable time! Upon arriving the owners and I had good conversations about the home. Their home is very accommodating and met all of our needs. You walk into the home and it’s immediately inviting. Cooking was great, we had to search for all of the cooking pans, etc but it was all in the kitchen that has many many cabinets and drawers. Very home-like. We had a fantastic time and can’t wait to stay again. Thanks for those kind words. We're so happy that you felt at home in our home. Please come again (try the summer -- the pool is fantastic!). I have organized seven VRBO / Airbnb rentals for groups of 5-10, and I think this was the best so far. The house is very clean and is kept up well. The pool is beautiful. Great deck with fire pit and grill. Plenty of beds and excellent use of space for a group. Will definitely consider a return trip. Eugene and Denise have a lovely home. The house is furnished beautifully and is very clean. The kitchen is stocked with everything you can think of, speakers are throughout the house and lets not forget the glorious 85 degree pool where we spent most of out time. We would highly recommend a visit and we will definitely be back. We rent exclusively from VRBO and have stayed in some beautiful spots. This was our favorite home by far. Our group was made up of seven adults, four children and an infant. This spacious home allowed us to enjoy each other's company yet spread out for a little down time. The heated pool provided so much fun for children and adults alike. Our vacation in July was very rainy but it didn't stop the kids from being in the pool by early morning and throughout the day. The owners have the house stocked with essentials and so much more. Their welcome document provides all of the information you could possibly need to relax in their home and enjoy the surrounding area. They emailed during our rainy vacation, out of concern, to offer some ideas for nearby activities and attractions. We were so grateful for their attention to our comfort! 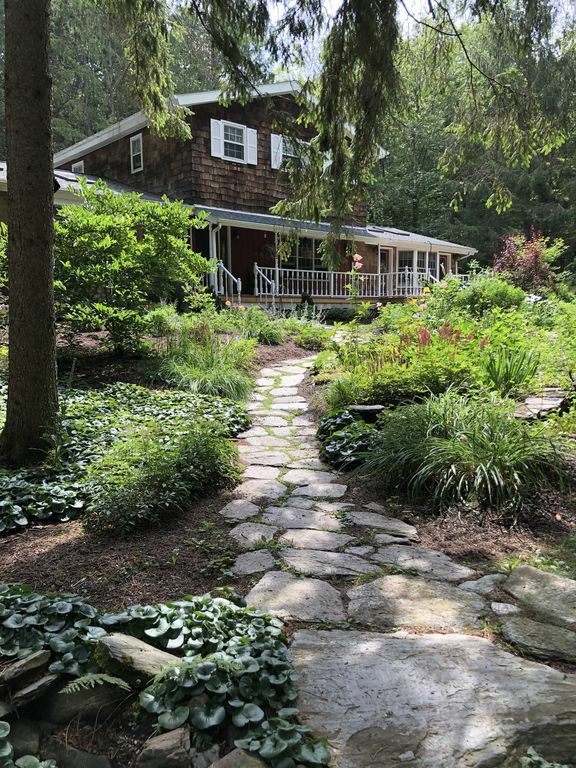 If you are looking for a quiet place, surrounded by nature with all of the amenities of a lovely hotel, we highly recommend the Berkshire Beauty. Thank you to our hosts for a memorable vacation! We love our dogs and want you to be able to vacation with yours as well. But we do find, however, that our cleaning costs escalate when we host our four-legged friends. So, we ask that you pay an additional $100 cleaning fee to cover those additional costs, and we reserve the right to ask for an additional fully refundable cleaning deposit on top of the fee. Although we don't anticipate it, stuff does happen, and if your pups do damage the house we will expect you to cover it (to the extent that the damage insurance that you automatically get does not cover). Of course, you assume all risks (including risks to your pets). Having said all of that, please know that our dogs love visiting the house -- and don't forget to make a little noise before letting Fido out in the fenced in back yard (to clear out any wild life that has wondered in).